I'm really loving the colors and the lighting along with the music. It's super relaxing to play and I like all the different quests intertwine! Pitch/Information: A mutant survivor of Transigen copes with body dysmorphia. (X-Men AU Fic). It's an interactive twine fanfic with two endings dealing with themes of body modification, reclaiming one's body after trauma and coping with anxiety along with the stress of dealing with family. I'd like feedback on: Grammer, world building, pacing, plot holes, the storyline itself, if the writing is engrossing. I need help on: Keeping the storyline interesting. Did not expect the clapping, that caught me by surprise. The dice animation is cool. Man, the sounds of empty hell is eerie. As I keep playing the game, the omnious feelings build. The sound effects really add to the atmosphere. Same with the emphasis on things getting cold. Can confirm firefox gives it issues. Holy crap, I haven't even started the game yet and the landing page/game screenshots LOOOK SOOO PROFESSIONAL. How long did it take you to do the art ? what game ending did you use to make this? Oh maaan, the spreadsheets is a great idea. Hope you feel better! I also followed your page and I look forward to any drafts you make of sleeping beauty wlw! This is the map for the demo. I snipped dead ends, put all the empty pages away from this map, added some programming to the cell phone options, did some editing, etc. I also did some planning for stuff I want to do once this demo is done. Basically, I did clean up work to take a break from the "ocean storyline." Now I just have to finish the swim and body painting endings, and then style it. Thats a great title screen! I love how the letters float! It's inspirational seeing you make this, since you started with zero experience in programming! I mostly finished the neoprene top page today. Just have one little bit to finish. I ended up cutting out the hair accessory options I wanted to work on. But I'm started to feel burnt out so -snip.- It was a bit stressful trying to figure out what I wanted to type, psychologically overwhelming. Just gotta finish the two endings then. Guh. The body painting page is defintely gonna need to have its ending merged with it. Two pages is better then four to write for. Here's a peek of the coding that went into that page. Certain paragraphs will only show depending on what tailskin you choose earlier in the story. Since this jam ends on the 16th, I think having this storyline ready to play in a rough draft/cleaning up the other pages is my end goal. how many drawings do you like to keep in batches? also emoting sprites is a really good idea! I bet it will look super slick when done! A map of the storyline I'm working on right now. I finally figured out the programming that I needed, aka the body mod choices you make sticking into the next passages. I still need to finish the "neoprene" top passage and the hair options that spawn from that. Plus the ending. Along with the "body painting" page and the ending that comes with that. For this storyline, I have at least four more pages to write and code. Not counting the other storylines, yikes. The critter looks so cute and its really neat seeing your process! Good work so far! I'm digging the room! Woah, look at that map! Good work and I'm digging the new sprites! The lights are a nice touch! Relatable and has the early 2000s vibe HARD. During the ritual, I was super anxious that one of the family members would interrupt lol. Omfg, i got a bad ending. I didn't even know this game had bad endings. This is a very nice game and the art's adorable! I found the writing to be hilarious and it kept me entertained the whole time. thanks for this, i found this super useful! This game is not going to be done in time by the end of the jam, I can already tell LOL. It has multiple endings. 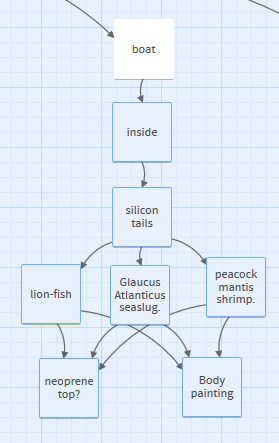 Most of the storylines are just rough concept right now, but I have concrete work now on the "Ocean" storyline/thread! I pared down a lot of the body modification options and I'm going to interweave those with the "Family" storylines, where you interact with your various half-siblings and parental figures. Some of those will have them helping you with body modding options while others will disapprove and try to put a stop to it. There's also what I call the "Ouch this hurts" body mod options via the diy tattooing and scarification but I'm not sure if those will be interwoven with the Family storylines or left as its own branch. The world's half constructed so I had to patch out a backstory for Elijah whose a reference to the Onslaught character in X-men. Right now my main goal is have the Ocean storyline done by end of this week, I still have to figure out the variables in programming and finish writing out the tailskin options before moving on to the character's hair pieces before the end. I also want to attach pictures of the various animals that your tailskin is based off. (The character has a cybernetic hovering fishtail that replaced their legs) If I have time, I also want to draw out the inside of the character's fishing boat. Good work so far! The changing flowers is a nice touch! OMFG, YAY, I'M NOT THE ONLY ONE DOING A TWINEFIC. Your art's great and I'm looking forward to playing the finished thing! do you have any else/if macro tutorials that you reccomend? I'm sorry to hear about your beloved pet and good luck on the game making. Woah, I'm really looking forward to this if you completely finish it! Everyone is so cute and I love the color schemes! Thank you so much! The version listed above is playable but its a mess right now. I was really nervous posting this project here. 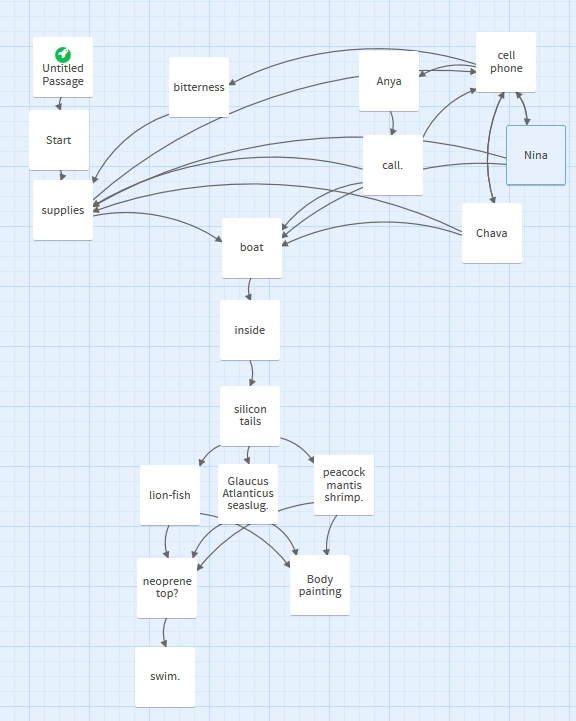 Here's the complex twine map, I'm hoping to fill out and add to, over the next week and a half. This is a fangame/interactive choose your option fanfic loosely based off the x-men mythos both comics and movies. It deals with a lab-born survivor of Transigen getting used to living in Genosha and coping with their trauma via body modification. Some transhumanist/cyberpunk themes. Various references to the x-men canons. I have a very unfinished version listed above. 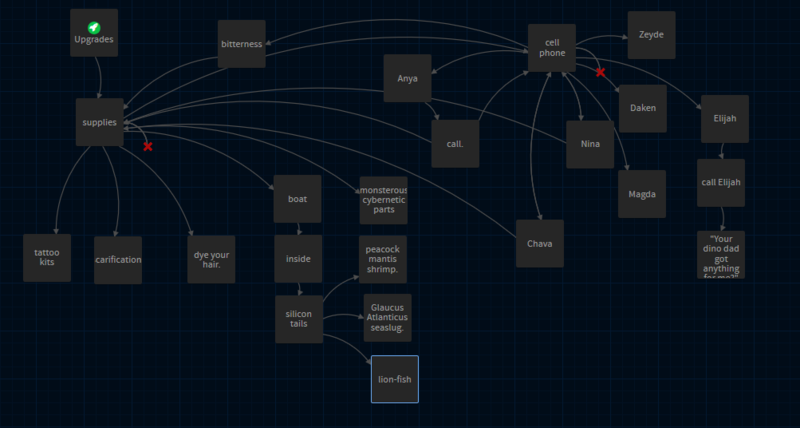 My main goal for this jam is to get more of this story finished and learn how to program in twine. I'm recovering from surgery so work on this project has been slow. So far, none of the body modification options are working and only the hair dyeing option has anything written in it. "Boat" has some words in it. And the cellphone options for who to call is only partially done as well. My current goal is to get the "boat" thread done and finish up the "elijah" thread. Good job on the progress so far! I like the art so far! This looks super nice for a first game! And the pixel people are hella cute. This is a really tough for me! Great game and the controls are really good. I really enjoyed this. This is pretty cool! I like the concept!